The best way to learn about the American Singer canary is to visit a show. These are song trials where the birds compete on their singing abilities. Canaries naturally sing at daybreak, so they can be conditioned to sing for a judge by uncovering them! American Singers are judged in groups of 5 to 9. Each group is a mixture of birds from different exhibitors. 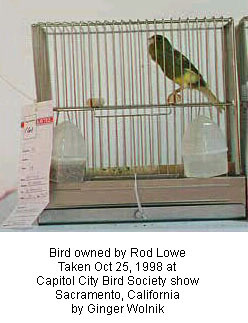 Each bird is kept in a standard show cage with only a show registration number identifying it. In other words, the judge does not know who the bird's owner is. All the birds are kept in a holding room and their cages are covered with a light sheet while waiting to be judged. When it is time to judge a group of birds, they are uncovered and brought into the judging room. They have 20 minutes to sing for the judge, who will evaluate each bird's song. Other people are allowed in the judging room to observe and listen, but no one may enter, leave, or speak during the 20 minute evaluation period. 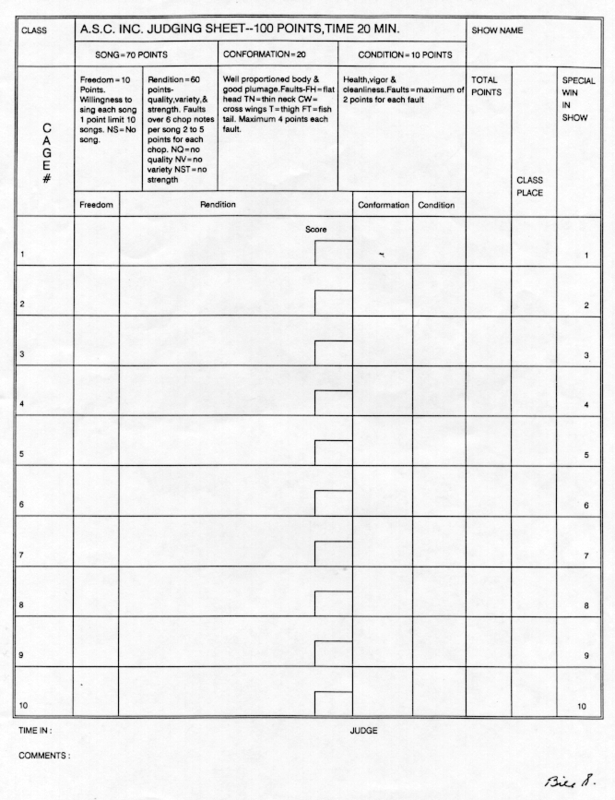 The judge also evaluates the condition and conformation of each bird, but most of the points are weighted toward song quality. After all the birds in the show have had a chance to sing, the top scoring birds are choosen as the winners. The American Singers Club provides rosettes to the top 5 scoring birds at sanctioned shows. Three medal medallions are also provided to shows with at least 100 birds entered for the top 3 birds. Two medallions are awarded if the number of entries is between 50 and 99. One medallion is given to the top bird if less than 50 birds are entered. New shows are awarded all three medallions regardless of the number of entries. A certificate is given to the owner of the top bird. Additional awards such as plaques and ribbons may be provided by the local host club. Click here to see a photo from an awards ceremony. This ASC award is awarded to the ASC exhibitor who has amassed the highest total number of show points during the past show season. The point system is explained in the Constitution. Clifford Williams was the winningest American Singer breeder/exhibitor ever, who won an unprecedented 300 plus first place wins and 16 Kellogg Trophies (Best of Breed at the annual National Cage Bird Show). See the Past Cliff Winners to see who has won this award.